Keep your site up to speed! To help increase your site’s page speed, Team up with 3PRIME! What is Page Speed Optimization? Page speed optimization involves fixing any and all site elements that can prevent a page from loading quickly, thereby increasing the time to finish delivering a page to a user’s browser. 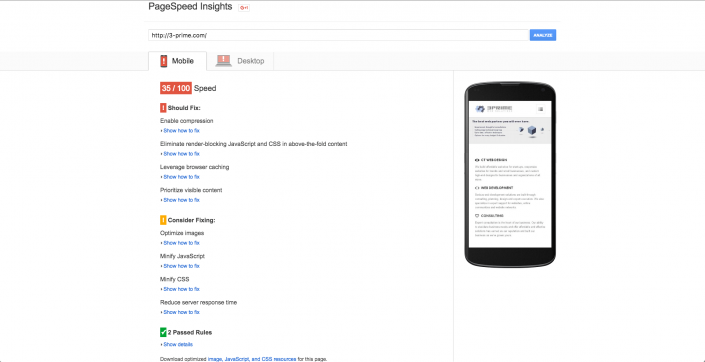 Will Optimizing Page Speed Make a Difference? Absolutely! Not only will the user be grateful that you have a quick website, optimizing your site can be vital for ensuring more frequent visits. When clearing issues that would drag down your site, you also increase the performance of elements that guarantee you better SEO results as well. Where Can You Look Up a Site’s Page Speed? You could find a plethora of metrics to analyze your site and determine the speed in which it loads. At 3PRIME, we rely specifically on the results calculated at Google PageSpeed Insights. 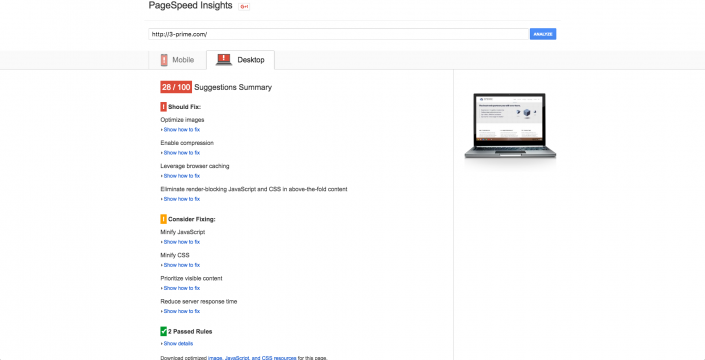 PageSpeed Insights helps analyze any given page you wish to see and gives it a proper score, ranging from 0-100. The higher the score, the more likely a page is going to load as quick as possible. On top of the score is a base color which helps determine what is, or isn’t, acceptable for a page’s speed. Red is given for “failing” scores (0-59), orange is given for “acceptable” scores (60-79), and green is given to “successful/outstanding” scores (80-100). Google’s Insights are also handy to use for page speed calculations because it factors in a website’s performance rate on both mobile and desktop devices at the same time, giving the page a unique score per each platform. How is Page Speed Determined? Browser caching: If there are any resources/elements that are being retained by the browser over long periods of time, then the browser’s time to deliver a page will increase. Image amount and size: Pages will see an exponential decrease in speed with each image that is added on, especially if the images are larger in size/space. Server response time and data transferred: Some issues with page speed may not exist on the front end, which usually implies the server could be having trouble handling certain requests or with sending all of the data that is being requested by the browser. Page redirects, HTML size, prioritized content, and more: These are additional factors that, while not being a larger weight on the scale for page speed score, also count towards an overall grade. What Can Be Done to Improve a PageSpeed Insight Score? Installing and modifying plugins: For many content management based websites such as WordPress, plugins can be considered either a benefit or hindrance for speed of a website. There are plugins for any occasion – AutoOptimize can help with the delivery time of both JS and CSS, while WP Smush specializes in image optimization for saving space/size. Cleaning up/Consolidation: In the case of messy or congested HTML, it is always helpful to go through and clean up. When cleaning code, it’s also helpful to make note of any abundance of resources and seeing if there is a way to consolidate and combine them. For example, combining the code from multiple CSS resources into one file that is easy to access/load. Image optimization: Reduction and compression of certain images can always reduce the wait time for that image to load on a page. When using image software such as photoshop, it’s important to make sure you are not losing too much resolution when compressing and adjusting the size. Modifying htaccess file and setting restrictions: The htaccess file is incredibly important, as it can accomplish some great page speeds by altering or adding on to the file. Setting browser caching limits for certain files/filetypes, declaring page redirects, and adjusting a max file upload size limit are just a few examples of what the htaccess file can accomplish for a site and its speed. Using content delivery networks or other similar services: Certain web and content delivery services (such as Cloudflare, for example) have features which can provide benefits for any website, including assistance to help a site load faster. Who has benefited from 3PRIME’s Page Speed Services? How Much Does 3PRIME Charge for PageSpeed Services? We are currently offering a package for a 10-hour engagement at $1250. This package includes performing constant tests and various enhancements to ensure your pages and site have an exceptional delivery speed. If you have any other questions, or would like to know if your site needs these services, don’t hesitate to contact us today!